The name of Saint Louis is often evoked as a patron saint of the Third Order. I realised this year that I had been a tertiary for 30 years and have a rough knowledge of Saint Elizabeth of Hungary and perhaps a better knowledge of the Mother of our Lord, but knew almost nothing about our third patron saint. France’s finest medieval historian Jacques LeGoff was director of studies at l’École des Hautes Études en Sciences Sociales in Paris. He has a particular interest in Saints Francis and Clare and the spread of their movement through Europe in the 12th Century. His studies into money and Saint Francis and medieval culture and the church not only provide new insights into Francis, but are also inspirational for Franciscan living. Surely, I thought, from his ten year-long study of Saint Louis, which resulted in this book of nearly 1,000 pages I would both learn more and be encouraged in my Franciscan journey. Saint Louis is a fascinating book to read. In the first Part, Professor LeGoff draws on all the evidence at his disposal to lay out the life of Saint Louis: he covers his childhood, the influence of his grandfather Philippe Augustus, the early death of his father Louis VIII, his co-regency with his mother Blanche de Castille, Louis’ piety and close circle of advisers, his departure on two crusades, the better organisation of his kingdom under the principles of justice and peace, and his death in Libya. The king was deeply influenced by the new religious orders. He founded a Carthusian monastery called Royaumont. There were always friars in his retinue, including the Franciscan Geoffroy de Beaulieu, one of his confessors whose biography was instrumental in the king’s candidacy for sainthood. At this time in history the Preaching Friars and the Friars Minor were popular with royalty everywhere. Louis’ brother-in-law Henry III of England also included mendicants in his entourage. Part II of LeGoff’s book interrogates the evidence at greater length to explore how much can really be known about Louis Capet as an individual, given that many 12th Century writers attempted not to write accurate portraits of public figures but to delineate ideal princes. LeGoff concludes that we can dig through the flattering surface of the documents and find an individual. Part III includes family trees, charts, bibliographies, extensive notes and the text of Saint Louis’ letter to his subjects after his first crusade. Gareth Evan Gollrad has done a mighty job in translating Saint Louis into English. Rarely are you aware that you are reading a translation. I was a little disappointed that maps and charts were not completely translated, so would not be accessible to all English readers. There were occasional surprising non-translations, for example, Saint Benoît is not translated when referring to the Benedictine monastic tradition. Louis IX is the first person recorded speaking French. He was in the habit of sitting on the ground, partly as a disposition of prayer in his chapel, and partly to put people at ease in the presence of the king. He enjoyed laughter and jokes with his close friends, and in fact, liked laughing so much that he tried to fast from laughter on Fridays! His personal practice including hearing as many offices recited during the day as possible, adjusting prime to 2 a.m. rather than midnight so he had enough energy to govern the country during the day. His confessors often thought him excessive in his asceticism and talked him out of fasting from meat on Mondays as well as Wednesdays and Fridays. Friar Geoffroy cautioned him to be gentle with flagellation. He gave alms to the poor. He knew it was his duty to do this publicly in procession, but he also privately fed the poor from his table, feeding the handicapped with his own hands. (These were the days before kings were sequestered from their people in lavish palaces.) Louis was privately generous with money not only with the poor, but with close friends like the knight Joinville who lost everything in the crusade. He believed he was called to go on crusade: even though a little late in crusading history he was a Christian king of his time. He was a fighting knight but he had learned from St Francis, and his strategy included converting the Muslim leaders. He wasn’t successful, but in captivity he was allowed to keep his breviary. His captors respected his faith as the Sultan had respected Francis’s. In preparation for the Crusades, King Louis did what no king before had done: he actively sought the forgiveness of his people, sending agents throughout his lands and making good any injustices that he had caused. Returning from his first crusade, he spent time with the Franciscan Hugh of Digne, and was so impressed with Friar Hugh that he begged him to come to Paris to join his retinue. Hugh refused, but Louis implemented Hugh’s ideas. The Franciscan’s biggest idea was that everything in the kingdom’s administration should serve justice and peace. In a feudal world, this was radical. It meant, for example, that Louis took direct control of the growing towns, because without his authority, the poor and the lesser people would never see justice. Hugh also apparently persuaded the king to tone down his dress and personal style. Louis considered one of the great acts of his reign buying the Crown of Thorns and a piece of the Holy Cross from Constantinople. The purchase price was so high Louis had to raise cash to secure them and have them escorted back to Paris. 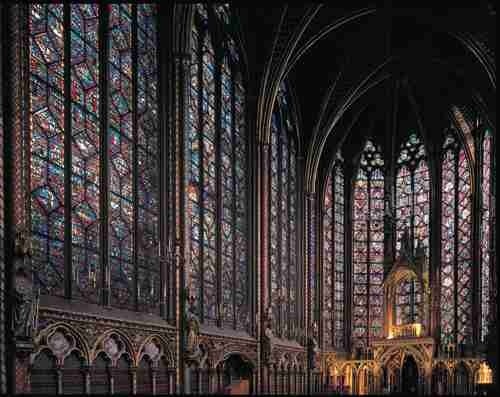 To house and expose these relics he built the exquisite but also expensive Sainte-Chapelle primarily as his private place of meditation. In the coronation liturgy, Louis was crowned “the most Christian” king. His aim was to live out that promise. By the standards of the day, he was a holy man as well as a monarch who was wise enough to guide his people on the transition from feudalism to a more central society. But strangely, for this reader at least, Louis was not a tertiary. He gave equal favouritism to Carthusians, Dominicans and Franciscans. Though critics taunted him by claiming he was a secret Franciscan friar, LeGoff decides there is no possibility of the king belonging to any Order. As a Frenchman, LeGoff has a particular interest in Louis’ nation-building; however, for me, as a Christian, the strength of the book was in the sympathy with which LeGoff explores the details of the Saint’s life. Some aspects make us cringe because we live in a different world. Some, like his indifference to his wife, make us cringe in any era. So while the “real” Louis IX may not have been a Franciscan tertiary, his emphasis on peace and justice and his adaption of the values of poverty and joy make him an appropriate Franciscan patron. Jacques LeGoff has given us a clear and complex portrait of a man of his time authentically living out his vocation. As Franciscans, we may not be able to claim Saint Louis as one of “ours” in any tribal sense, but as a Christian learning from Saint Francis and living a complex life, Louis can be for us a paradigm of embodied Christian living in all its richness and ambiguity. Today being the Feast of St Louis, I re-post my 2013 review of Jacques LeGoff’s excellent book on the king and saint of France. An example we could use today both within the church and in politics, refreshing. As you would be well aware I serve in a parish whose main centre is dedicated to Elizabeth of Hungary, another example worth sharing in today’s world of meism and excess. Indeed. St Elizabeth was a tertiary and one of the other two patrons of the Third Order. Louis was a man of his time, but I agree his integrity resulted in wise politics and relationships. The Way of St Francis: poverty or littleness?